Reptiles are a common feature of Australia fauna, from sea turtles and crocodiles in the tropical north to skinks on walls in cities. Usually noctural reptiles that are insectivores, known for being able to cling to surfaces. A diverse range of small to medium lizards that are present over much of the world. Small to large lizards, usually diurnal. 70 species in Australia. Medium to large lizards found across the warmer parts of the world, including the fearsome Komodo Dragon. Goanna and monitor can be freely interchanged, the former being a corruption of 'iguana'. There are a multitude of snakes in Australia, many of which are highly dangerous as well as those that are harmless. S. Wilson and G. Swan, A Complete Guide to Reptiles of Australia, 2nd edition, 2008. 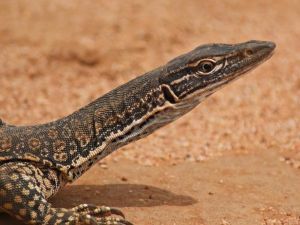 Reptiles Down Under's Australian Reptiles Online Database.